Expensive? Maybe. Indulgent? Possibly. Worth it? Most definitely! For what is Christmas if not the time for treating yourself and others? After a year of tightening our belts, surely we all deserve to sit down in a pair of loose fitting trousers and savour the richest flavours of the season! And rich they are! Come Decembre and suddenly flavours go up a gear. This is why, for me, christmas is not just about the presents: it is, most definitely, also about the food! Foie gras, smoked salmon, quails eggs, oysters, caviar, truffles: the most wonderous indulgences, and the best thing is that it's guilt free (atleast until January when I evaluate the damage). Obviously you can pop into your nearest supermarket and get a batch of own-brand smoked salmon etc- but if you are going to do it, why not do it properly? Personally, I'm the kind of person who would rather save myself for a beautiful corn-fed chicken than eat tasteless battery fillets every day of the week. I am a firm believer in quality over quantity, and so I prefer to take my time to seek out the best produce: a bite of something exquisite is always more satisfying than a platefull of something bland! As lovers of oysters know, the most important thing when buying is their freshness, and with cornishnativeoysters.co.uk, freshness is not an issue: their delicious Cornish Native Oysters are delivered immediately the next day. And delicious they are! Naturally spawned, the taste is exquisite because of the local geology around the River Fal.The taste is described as salty (from the constantly changing tidal seawater), sweet (from the fresh filtered mineral waters), metallic (from the unique geological Cornish landscape) and creamy (from the high levels of fresh plankton). It sounds intriguing and I'll certainly be trying it out with my next dozen! I had always stayed away from caviar, thinking it would be the same as the radioactive, red supermarket fish-roe my grandmother used to hand around every year at christmas. When I finally got to taste the good stuff, however, all doubt was dispersed. Unfortunately for my wallet, I am now a convert. Caspian Caviar was founded with the aim of suplying caviar directly to people's homes. All their caviar is caught processed and shipped, under strict adherence to the CITES rules and regulations. And they have a fantastic, well-priced selection: from sustainable Salmon Caviar to the finest Farmed Imperial Oscietre... And while you're browsing their site, you can also take the opportunity to look at their other luxury products: fresh white Alba Truffles, fresh Duck Foie Gras lobes, L`Artisan Chocolates and specialist Vodkas...a perfect one-stop website. Now, if you're one of those people who actually enjoys the "shop" bit in shopping, then I highly recommend you make your way over to Princess D'Isembourg, in Holland Park. 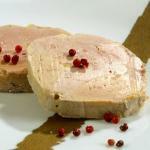 Their main Product Range is caviar, but a slice of their "Terrine de Foie Gras Maison" alone is worth the visit! Complimenting their range are the white and black Truffles, Salmon Keta (SAVIAR), dried Morels and Cepes, fresh Foie Gras, Saffron, Smoked Salmon and their own Brut NV Chamapagne. Private Callers will particularly enjoy their free Parking Area! Of course, it's wonderful to enjoy these luxuries within the comfort of one's own home, but sometimes it feels like an extra treat to have them at a restaurant. If you are so enclined, there are two places I particularly recommend. As some of you may have realised from a previous article- I have a small obsession with oysters: I am physically incapable of NOT ordering them as soon as I see them on a menu. Though a burden to my wallet, this compulsion puts me in a very good position when it comes to recommending places to go for the delicious shellfish. I was lucky enough to be taken to Hix's Oyster and Chops Bar recently, and can safely say they were the best oysters I have had in London (I want to say "ever", but I'm making allowances for the fact that the several glasses of champagne I had may have impacted my judgement slightly...). The fantastic thing about this restaurant is that if you happen to be going with someone who isn't a fan of them, their is a wonderful variety (as the name suggests) of equally tasty meatier alternatives. So there you have it: Happy shopping- I hope you have the most delicious Christmas!